Belmar New Jersey is located in Monmouth County. It is an extremely beautiful community that has a combination of rural beauty, small-town charm, and a rich community life. There are many excellent recreational activities in and around Belmar that are enjoyed by residents and visitors alike and has attractive beaches and boardwalks that are open year-round. In the summertime, residents and visitors enjoy swimming, sunbathing, surfing, fishing, boogie boarding, and kayaking. The boardwalk extends along the beautiful Atlantic ocean shoreline for over 1 mile and it provides the many strollers along the boardwalk with incredible panoramic views. The beaches are safe, clean, and sandy white and definitely add a lot to the incredible beauty of Belmar and is a wonderful community to raise a family or retire. The median age is 46 and over 85% of the population are over the age of 18. If you are considering a move to Belmar it is interesting to note that over 50% of the homes in this area are self-owned. The median property monthly rental costs are approximately $1200 per month. The median household income is just over $60,000. The language ratio in Belmar, NJ is 83% English only. Belmar is a community that will provide you with an excellent investment opportunity if you are thinking about purchasing a home. 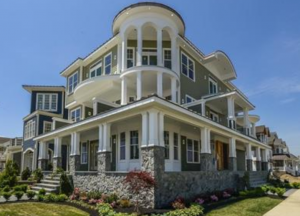 The median home value in Belmar is just over $500,000. However, there are many smaller homes that can be bought in the $300,000 range. There are reputable and helpful real estate agencies in the area that can provide you with a good selection of recent listings. Many of the local residents have nothing but good things to say about Belmar. The town has a small one square mile area but the residents are amazed at how many unique restaurants and adorable shops are located in this quaint little town. Even though many of the shops are geared towards the influx of tourists, you still will find many excellent bargains at a variety of shops. Belmar has 6 excellent schools that will provide your children with a good education. The schools include 3 elementary schools, 1 middle school, and 2 high schools. Children who live in Belmar love being close to so many awesome destinations. Some of the more popular destinations for both tourists and residents include Avon by the Sea Public Beach, Allaire State Park, and the Belmar Beach. There are many interesting things to do in Belmar including beach-combing, cruise nights, strolling through the Antique Fair, enjoying free summer entertainment, watching the St. Patrick’s Day Parade, participating in the sandcastle contest, watching a movie on the beach, playing volleyball on a sandy shore, clamming and crabbing, or enjoying an evening at a gourmet restaurant. Yes, if you have an opportunity to visit Belmar, NJ then there is a good possibility that you will fall in love with the area and want to relocate there. As mentioned previously, purchasing a home in this beautiful Atlantic coastal community will be one of the better investments that you can make. Therefore, take some time to investigate all of the beautiful areas where you can purchase a home before you take a trip to Belmar, New Jersey.